First of all, pretty sweet title – Tenacious D – right!? I have to thank my wonderful wife for that one. A couple months ago she referred to Declan as being tenacious, and he really is. Next, we’ve been pretty fortunate as a family to be able to meet our needs throughout the challenges we’ve faced. We have a situation that is unique to us and we make it work to the best of our ability, as most people do. There are days where I’ve lamented that we don’t have it easier like some people seem to and times where I’m thankful we don’t have it as difficult as others. Sometimes the challenges (both autism-related and not) hit harder than others. In the midst of these challenges it’s often difficult to not feel overwhelmed with circumstances and with the road ahead. We are in various stages of many different transitions right now. I suppose life is just a series of transitions if you choose to break it down that way, but many of our changes are somewhat large in their scope. We have Declan approaching five years old, on the waitlist for beginning ABA. The timeline of this happening will contribute to decision making for the next steps for Declan as far as school goes. He’s on the waitlist for a service dog. He’s potty training. He just finally received his assistive speech device and is learning how to use it. The list goes on. Silas, who is coming up on three years old is going to begin working on potty training to lay down the foundation to begin school early. He is a part of all these transitions as well. He is in the throws of being a passionate two year old and is understanding more and more by the day. A rare moment of the brothers occupying the same space. To top it all off, Christa is running a business from home and I’m beginning training for a major career change. We try our best to fit in gym time, personal time and time together as well. Ugh. There’s just a lot. Life is great and life is full. Life is challenging as hell. We have had times recently where it has been very challenging to not feel defeated. 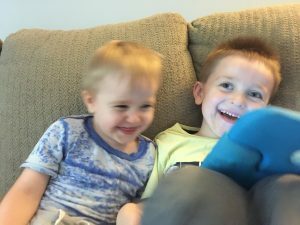 Some of these times we have simply chalked up as being “one of those days.” And while this is certainly true, in that having a two year old and a four year old can yield many of “those days,” it’s been more than that as well. Managing Silas’s two year old ways is challenging but he is so transparent and so simple in his needs when you break it down that it’s pretty straightforward. With Declan on the other hand, there are a lot of educated guesses and shots in the dark on our part to try to assist him at this point. Declan is gaining communication and new skills very regularly, but we are often still left trying to divine what he’s attempting to tell us and what he needs. If we don’t get it right it can easily lead to meltdowns that can, and do sometimes encompass a good portion of the day. We often don’t know what is a four year old behavior (or two or three year old, depending on Declan’s level of development in a given arena), what is autism, what is sensory related and what is stress or anxiety related and what triggers all of these. 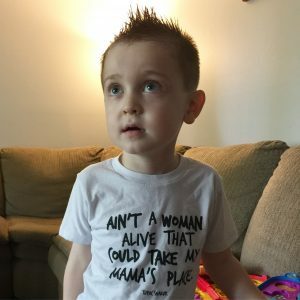 Declan has been undergoing therapies for most of his life at this point. The past three and a half years have been comprised of meetings, therapy sessions insurance battles and lots of hard work on Declan’s part. All of this hard work has definitely paid off, but we still have hard days. Days where both boys throw down are hard. And when the reason why it happens escapes us, it becomes harder. And when calming Declan ends with being kicked in the face, it becomes more difficult yet. And when the simple plan for the day becomes totally derailed because I can’t help my son cope… well, that’s where the feeling of defeat rears its head. Declan is growing. Fast. And he’s getting stronger. I don’t like the thought of using all my strength to have to physically restrain my son. It makes my heart heavy. It is a potential reality in our future though. I don’t like the thought of Declan growing up and not being able to cope and care for himself on his own and requiring life long assistance. That, too, is a potential future. We simply don’t know. It’s the frustrating and defeating moments that bring to light these thoughts and make me realize exactly how far of a road we have ahead of us. Declan is almost five. He’s so, so young and we simply don’t know what the future holds. Declan being almost five years old and us not knowing what the future holds is a very intimidating, scary thought sometimes. We don’t know how he’s going to grow up and mature. We don’t know if he’ll live with us forever or if he’ll have a “normal” life. It’s too early to be able to tell any of these things. On the other hand, Declan being almost five years old and us not knowing what the future hold is so incredibly hopeful. 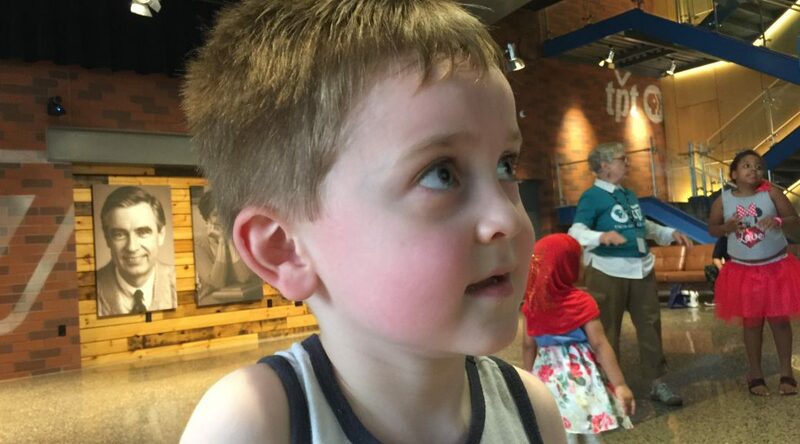 At under five years old, Declan has many dozens, if not hundreds of words in his vocabulary. He can read and spell most of them. He can count by ones, twos, threes, fours, fives and tens. He has an incredible memory and his self care and coping are continually getting better. While no, we don’t know for sure anything about the future, we do have some pretty powerful indicators with Declan that things will be wonderful. One thought process is based in uncertainty and fear. The other is also based on uncertainty. There’s also reason, logic, hopefulness, tenacity and a dash of stoicism in there for good measure. Days like that happen. In or out of parenthood, on or off the spectrum. They happen. It’s so easy to get stuck in the present and project it to the future. We don’t know where we’re going with total certainty but we do absolutely know where we’ve been. It’s easy to not give Declan the credit he deserves for his hard work. He’s so young and he’s been attending Fraser for most of his life. It’s so ingrained in our life that it’s all really second nature. We don’t often think that it’s not normal for such a little guy to have a heavy workload. In my moments of frustration and defeat I need to try to remember Declan’s tenacity. He works hard every day simply because that’s what he does. It’s what he’s learned and I think it’s probably in his nature as well. I need to remember to give him a bit of latitude because of that, too. I strive to be as tenacious as Declan. What does it mean to be tenacious? Well, for me, in regards to Declan, it means that I’m there for him and that Christa and Silas are there for him along every step of the way. I can guarantee that I will continue to feel frustrated and probably defeated from time time to time. I can also guarantee that those moments will pass and I will continue to give myself room to reflect, grow and move forward, regardless of what the future holds. Thank you, Declan, you tenacious little dude. Awesome read sir. Medical THC was just approved for autism in Minnesota. I’m sure you have checked it out. Thank you! It is on our radar as a possible tool at some point in the future, yes. We have been using CBD oil for a short amount of time with some promising results. We are open to learning about all possibilities.